There are few medieval towns preserved like Dvigrad – a town which dwells lonely amid modern populated cities, waiting to give you a time-travel tour through its streets deprived of traffic, crowd and noise. 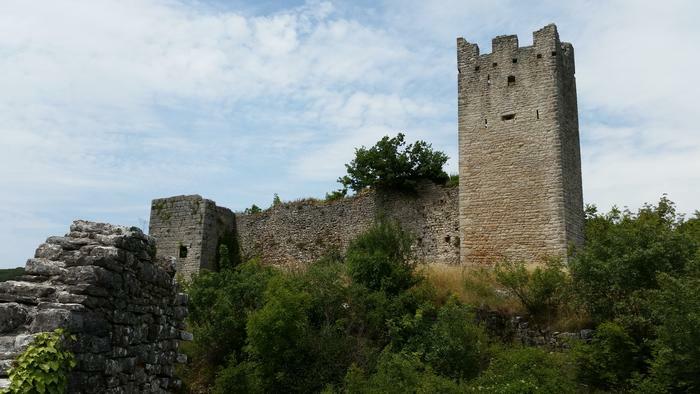 Enrich your holiday in Istria, the biggest Croatian peninsula, with excursion to medieval Dvigrad, a town bypassed by wars, battles and fire, and then suddenly abandoned in the 17th century due to plague. You'll find Dvigrad, whose history of settlement is prehistoric, at one of the main routes that lead from Istria's inland to the coast, in a close vicinity of Lim Draga valley near Kanfanar. This zero-category monument was once two castles – Parentin, abandoned in the Middle Ages, today inhabited by thick growth of evergreen shrubs, weeds and various plants, and Moncastello which offers its visitors fascinating stone streets with a medieval story of their own. For centuries city gates, city walls and several fortresses were defending Dvigrad from various conquerors. Remains of more than 200 buildings, preserved rectory and city guards dwellings close to the main gates tell us a story of more than 2000 Dvegrajacs (Dvigrad's inhabitants). Remains of the biggest abandoned city in Istria offer you a unique chance of experiencing a typical medieval town. In the center of Dvigrad you'll find a preserved St. Sofia Church. Many artifacts from its rich interior, including a 13th century pulpit with a carved relief of St. Sofia, are kept today in Kanfanar's church. Highly valued frescoes of the so called Colorful Master are stored in Archeological Museum of Pula. All in all, Dvigard and Central Istria are calling you to come and explore their historical treasures!